This sunny Saturday morning my friend and I wandered down the mini lanes and streets of Fremantle armed with cameras and a mission to shoot unique objects that define the character of the town. We had heaps of fun getting lost in the forgotten spaces and “accidentally” going into the courtyard of private residences (our defence is that they left their driveways open). We did have one guy come out of his house and ask us what we were doing. We said we were photography students (didn’t make much sense as it’s the middle of the school summer break). But he was friendly and let us take photos of his awesome courtyard anyways. As we were leaving, his lady friend came back with their coffees. She must’ve been wondering why two girls were thanking him and leaving the house just as she got home…fun times! We also stopped at a cafe/gallery called Moore & Moore for breakfast. 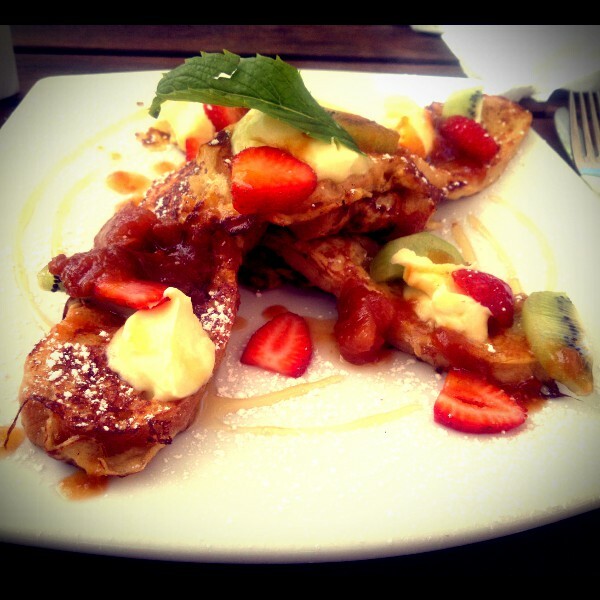 We shared a plate of sweet French toast with marscapone, fresh strawberries and kiwifruit. Delish!! The food there is great and very fresh! What a great find, can’t wait to go back there!